Curry Puff, a snack filled with curried mixture of meat, onion, and potato, is commonly found in Malaysia, Singapore and Thailand. Alternatively puff pastry (homemade or readymade) can be used. To fry or to bake them is not the question, because they both taste very good. In a bowl, combine curry powder, chilli powder and Worcestershire sauce. Stir in 2 tablespoons of water to make a thick paste. Heat oil on high and stir fry onions and curry paste for 2 minutes. Add in minced meat, diced potatoes and bell peppers. Cook until the meat has turned browned. Pour in water and let simmer on slow-heat for approximately 20 minutes until potatoes are soft. Stir in sugar, and season the mixture with salt and pepper. Continue to cook until it is about dry. Transfer to a bowl and leave aside to cool. To make dough, sift together the flour, salt and baking soda in a mixing bowl. Rub ghee into the flour mixture until it resembles breadcrumbs. Add water gradually and press into a ball. Knead the dough by pushing away, using the heel of your hand until smooth. Wrap in plastic film and let it rest for half an hour. On a lightly floured work surface roll out the dough thinly. Cut into circles, 8 cm in diameter. Flatten each round with a rolling pin, fill with a tablespoonful of the filling. Fold pastry over to make a half circle and crimp at edges. Alternatively fill one pastry circle with 2 tablespoons of filling, top with another circle, then seal and crimp at edges. Deep fry in hot oil until golden. If you prefer them baked, brush the tops of each curry puff with the egg wash and bake in the 180C/350F hot oven for 25 minutes. 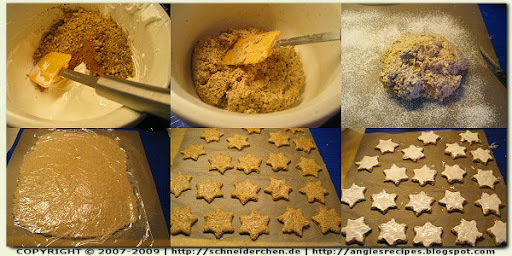 Cinnamon stars are popular classic German Christmas cookies. They are rolled and cut into star the shape of star. Light and crisp, they have a fabulous balance of nuts and cinnamon. So, don't miss the chance to relish these cookies and try baking it yourself. I wish you a warm and happy Holiday! Line a large baking sheet with parchment paper. Sift the confectioners' sugar. Blend together the ground hazelnuts and cinnamon. Whip the egg whites in a large bowl with an electric mixer on high speed until they hold soft peaks, about 1 minute. Gradually add the confectioners' sugar while whipping, until the whites are stiff and glossy. Reserve 3 tablespoons of this meringue for topping the cookies. Fold the nut mixture into the remaining meringue to make a stiff dough. Cover the dough and let it rest in the fridge for about an hour. Lay a sheet of parchment paper on the work surface and lightly dust with confectioners' sugar. Turn the dough out onto the dusted paper, and then top with a piece of cling film. Roll the dough until it is about 1/4 inch thick. Remove the cling film. Using a star form cookie cutter, cut out stars in the dough. To avoid the dough sticking to the form run the cookie cutter under cold water and then shake off any excess water. Transfer the cinnamon stars to the prepared tray using a metal spatula. Frost each cookie with the reserved meringue. If desired, decorate the cookies with almonds. Leave the cookies to dry out overnight. When ready to bake, preheat oven to 150C/300F and bake for about 10 minutes. Try to remove the cookies before the icing turns brown, although a little brown tint can look nice. Store in an airtight container at room temperature for up to 3 weeks. Nougat is a type of confection made from sugar, honey, and nuts. It is popular throughout Europe. The word “nougat” is French, and it comes from the Latin nux, for “nut.” The two primary variations of nougat are white nougat and brown nougat. White nougat is made with egg whites, so it is lighter, softer, and chewier in texture. Brown nougat is made with caramelized sugar, and tends to be harder and darker in color. Bring the whipping cream in a small pot to a boil over low heat. Chop the couverture into the smaller chunks and stir into the whipping cream until melted. Turn off the heat and transfer the mixture in a mixing bowl. Add in nut nougat, butter and peanut butter. Set it in a bowl of cold water and whip the mixture until fluffy and cold. Scrape the mixture into a pastry bag fitted with a star tip and pipe into the paper praline forms. Sprinkle the tops with preferred nuts. Cool the praline until set. One explanation of the saltless bread is that the Tuscans, well known for being tightfisted couldnt bear to pay the government salt tax and chose instead to make bread without it. Perhaps, but gastronomes point out that the Tuscan bread is perfectly suited to their cuisine, which is full of strong flavors. Pour the boiling water over the flour in a bowl. Stir until you have a smooth thick paste. Cool and and let rest covered with a plastic wrap overnight in the fridge. The next day, take the dough out of the fridge and let rest for an hour to bring the paste to room temperature. Place the paste and the rest of the ingredients in the bowl of your stand mixer and stir on low speed until combined. Increase the speed to medium and continue mixing until the dough is smooth and leave from sides of mixing bowl. Transfer the dough to a lightly oiled bowl. Cover and let rise until double in bulk, about one hour. Turn the dough onto a lightly floured work surface and divide it in half. Round each dough up and let the dough balls rest, covered, for 15-20 minutes. After resting, shape the dough into batards. Proof the shaped batards, covered,on a piece of parchment paper or in moulds or pans for about one hour. Meanwhile, preheat the oven and the bricks to 220C/450F. Once the dough has doubled in size, sift flour on the surface of the batards to create a rustic appearance. Score the bread and carefully transfer them on the bricks in the oven. Bake the bread for 50 minutes. Cool on a wire rack. This sweet treat with coconut aroma has a soft pudding-like center and crunchy shell. Combine together 250ml milk, coconut milk, sweetened condensed milk and salt in a pot. Set the pot over medium low heat. Don’t bring it to a boil. Dissolve the cornstarch in 50 ml of milk and slowly stir it into heated milk until the mixture is thick and smooth. Spread evenly in a rectangle dish and smooth the surface. Refrigerate until firm. To prepare the coating by mixing flour, cornstarch and baking powder in a bowl. Add in lemon juice, oil and enough water to make a thick mixture. Cut the milk custard into the smaller slices, using wet knife. Heat some oil to 175C/350F. Coat the custard with the prepared mixture and fry until light brown and crunchy. Drain on paper towels. Serve hot with sweetened condensed milk.